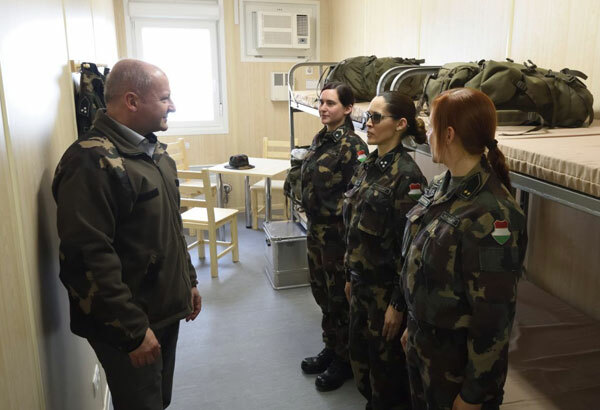 By Pablo Gorondi (Associated Press) | Updated March 21, 2017 - 7:04am HERCEGSZANTO — Hungary's defense minister inaugurated a small military base on yesterday on the country's southern border for soldiers patrolling to prevent the entry of migrants. Defense Minister Istvan Simicsko said that base built with the assistance of Austrian soldiers would provide "worthy" conditions for the 150 troops to be stationed there. The bases will significantly cut soldiers' commute to the border zone for the patrols carried out jointly with police "border hunters," Simicsko said. Prime Minister Viktor Orban said last week that a new fence being built on the Serbian border equipped with surveillance tools would withstand even a major surge of migrants, which Hungary is anticipating this year partly because of the deteriorating deal between the European Union and Turkey to prevent migrants from reaching Greece. Recent changes to Hungary's asylum policy, allowing the detention of all migrants, including children over 14, in border container camps, have also been the target of sturdy criticism by UN agencies and human rights advocates.